On Sunday evening at the Etihad Stadium in Melbourne, Australia, Holly Holmes stepped into the Octagon to face defending bantamweight champion Ronda Rousey. This was a fight not to be missed as Holmes tried different tactics to find ways to gain the title. Rousey has had 6 previous title defenses, the previous three fights together lasted 64 seconds. She holds an Olympic bronze in Judo and, previous to this fight, was 12-0 in MMA. 34-year old Holly Holms, nicknamed “The Preacher’s Daughter”, on the other hand is a world champion boxer who is undefeated in the 9 MMA contests. Two very different styles of fighting and two very different attitudes towards it. Rousey was the strong favourite but as soon as the fight started, doubts were in place. She refused to touch gloves with Holmes at the beginning of the fight showing her anger from the start while Holly seemed calm throughout. While previous to the fight Ronda said no one could knock her out, that is exactly what happened. 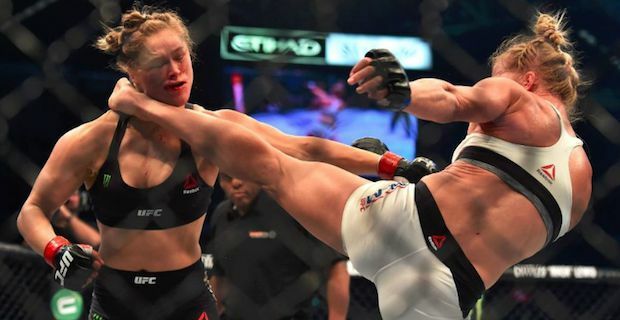 00:59 seconds into the second round at UFC 193, Holmes belts a high left kick to Rousey’s neck which takes her to the ground.